From the first patent in 1888, the ballpoint pen went through multiple incarnations to iron out the bugs and create the reliable, ubiquitous ballpoint pen we know today. In 1945 Gilbel’s Department Store publicized their new offering, with their entire stock of 10,000 pens, priced at $12.50 each, selling out on the first day. As demand rose, further improvements were made, and the price fell to as little as 19 cents each. By the end of the 1940s manufacturers in the US developed the Papermate pen. In France, Marcel Bich made refinements of his own, developing the Ballpoint Bic. Today, ballpoint pens range from cheap single-use pens for student, household and ordinary office use, to luxury refillable pens that are status symbols for executives. Logo’d Gear offers a wide range of ballpoint pens suitable for any occasion. Economy pens come in different colors and styles. The ultra-affordable Striped Stick Pen costs as little as 20 cents, and offers up to 40 characters and spaces in a single color. 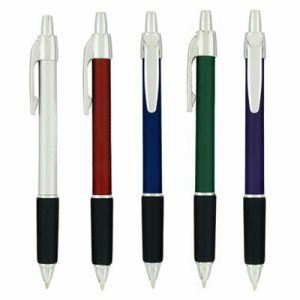 Retractable Solstice Super Glide Pens are refillable and come in six colors. 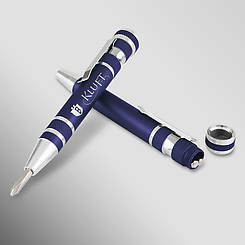 Archer 2 Click Action Pens can be screen printed with a one-color logo for as little as 28 cents each. Beautiful Rhea Retractable Pens, with a pearlescent barrel and soft rubber grip, are available with a single color screen print for 37 cents each. Pens with distinctive looks are available in any price range. Novelty pens start with puzzler pens, featuring a ball maze. Short pens of different styles are a compact 3 inches long. Carabiner pens hook on to stay handy. Two-in-one highlighter pens start at 54 cents each. Neck pens are ideal for folks who must always have a pen on hand. Key ring pens in multiple varieties are ideal for automotive businesses. Rainbow Gel Gripper Pens offer vibrant ink colors that change over the life of the pen. The Shapester Ball Pen and Magnetic Clip Pen stand out with unique curves. Some pens offer shaped tops, attached sticky notes, a retractable calendar, or even a tape measure. The bendable Spring Pen is sure to attract attention. Go green with recycled and biodegradable pens. Upscale pens include brass barrels, gorgeous lacquers, mother-of-pearl and black onyx, marble, and crocodile leather that make a lasting impression. Lavish gold-plated executive pens add prestige. No matter what the image or need, Logo’d Gear offers the right pen for the job.